Important business connections will be made as Aboriginal and non-Aboriginal businesses and professionals come together at the River Cree Resort. “The Aboriginal Business Match … offers a national network of qualified decision makers … and their goal is really to support business development, training, and employment. It’s really a natural fit for us in terms of having a partnership that would benefit our members but even broader than that,” said Debbie Houle, president of Aksis. Aksis, in its fourth year of operation in the Edmonton, has 100 members and associate members. It’s a collection of Aboriginal businesses and professionals along with organizations that want to work with Aboriginal businesses. Something like ABM, says Houle, is a perfect fit for her organization, as ABM represents Aboriginal and non-Aboriginal businesses as well as a select non-profit organizations. She adds that Aksis isn’t at the stage where it can match businesses and opportunities. “The beauty of the Aboriginal Business Match is that they’ve created a process and a platform to be able to match opportunities around Aboriginal businesses,” she said. Houle likens the process to speed-dating. ABM has a database which allows businesses to record the services or product they offer as well as allowing businesses to record what services or products they need. Set by appointment only, businesses go on the floor and meet with other businesses, determining what services and products are available and how businesses can strike partnerships to work with each other and purchase from each other. According to a news release issued by ABM, 92 per cent of delegates developed key contacts anticipating post-event deals, and 20 per cent made deals directly on the tradeshow floor. Part of the success of ABM delegates is in the preparation. Delegates who attend choose from a selection of potential business matches through ABM's sophisticated business matching software, which efficiently facilitates one-on-one pre-schedules appointments through targeted selection. ABM has been brought to Alberta for the first time in partnership with Enoch Cree Nation and Sunchild First Nation. ABM conducts similar events throughout Canada. "Our priority is to continue to grow and develop our economy. We believe we can achieve this by creating partnerships with companies and other Aboriginal communities that align with our values," said Sunchild First Nation Chief Jonathan Frencheater. Houle sees ABM as just one more step in positioning Edmonton as the Aboriginal business capital of Canada. With two progressive mayors – Don Iveson now and his predecessor Stephen Mandel – as firm supporters of the city’s Indigenous peoples, with the city a key funder of Aksis, with Edmonton pushing to soon become the urban centre with the highest Indigenous population, and with the city’s geographic location as the gateway to the north, Alberta’s capital is well on its way. 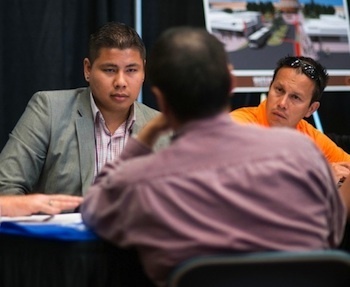 Aboriginal Business Match takes place Sept. 19 and 20.